Schmitts' Quest for the Cure – Join us on our quest to cure Diabetes! Over the past few years, we have continued to be a successful team built with our family and friends to find a quest for the cure. We would love to include you in our journey! We have raised over $40,000 and are determined to continue our success. We appreciate all of your support and your inspiration to continue our quest to find a cure. Thank you for visiting the website and for sharing with your friends and family. 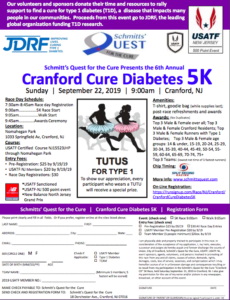 As Cranford High School graduates, Gloriarose ‘04 and Andrew ’97, we have dedicated the past 13 years ambitiously striving to raise money to cure diabetes. Gloriarose’s diagnosis of Type 1 diabetes in 2001 motivated her to pursue a nursing career. She’s currently employed at Memorial Sloan-Kettering Cancer Center in New York. When Gloriarose asked family and friends to join her first Tour de Cure team, GR Groupies, Andrew enthusiastically helped her recruit riders and donors. Ironically, in March of this year, Andrew was also diagnosed with Type 1 diabetes. The organization originated as a family and friends team that rode each year in the American Diabetes Association Tour De Cure. After 11 years of enthusiastic participation, we took our fundraising efforts to the next level! The organization has collaborated on previous fundraisers, having fielded a team for the ADA’s Tour de Cure every year since 2003 and organizing an annual volleyball tournament at Roselle Catholic High School, beginning in January 2009. We also ran a golf outing in Mechanicsburg, Pa., and another at Galloping Hill Golf Course in Kenilworth. In 2016, we teamed up with JDRF to organize a 5k walk/run in which we raised over $10,000!